The South African-based subsidiary builds the Ranger pick-up at its Silverton assembly plant in Pretoria‚ and engines in Port Elizabeth. Odell said: "When you look at the size of Silverton‚ you have to say there is capacity to source more from here." Silverton‚ with an annual capacity for 110‚000 Rangers‚ expects to build up to 75‚000 this year‚ compared with 63‚000 last year. With about 65% of production going to 149 export destinations‚ and many of those forecasting market growth‚ Ford Southern Africa president Jeff Nemeth said prospects for increased production were good. Odell said that while it was too early to say where Ford would source vehicles for its sub-Saharan push‚ it is normal to supply a region from within that region. "I can't exclude the possibility of new products being built in South Africa," he said. He was no more forthcoming on other possible African sites for vehicle or components production although Nigeria is known to be trying to woo multinational companies to help it set up a motor industry. 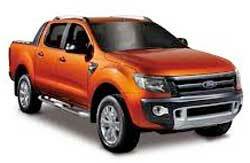 South Africa is Ford's second-biggest market in the Middle East and Africa region‚ after Saudi Arabia. MEA's president James Benintende said the establishment of the new division recognised the growing importance of its emerging economies. Ford sales in MEA countries are expected to grow from 200‚000 last year to 250‚000 this year. This is well short of numbers in established markets such as the US and Europe‚ where sales last year were 2.5m and 1.1m respectively. But Benintende said long-term growth prospects were excellent. "This is the final frontier" for Ford‚ he said. In sub-Saharan Africa‚ it may take time for that growth to take hold. Odell suggested Ford may have to be patient for between 10 and 15 years for many of the region's economies to grow to the point that the region could realise its sales potential. However‚ Benintende summed up the uncertainty felt by multinational motor companies‚ which have waited decades for African markets to take off‚ when he said: "Like China‚ Africa might have exponential growth. Then again‚ it might not." Nemeth said previously that for vehicle sales to take hold properly in sub-Saharan Africa‚ it would require the creation of an African free-trade area similar to those that have encouraged trade growth in Europe‚ North America and Asia. He added that Ford's recent success in South Africa - where sales grew 40% last year and are up 20% so far this year - gave it the confidence and momentum to expand its presence in the rest of Africa.